Attention hippies and paranoid schizophrenics: No, the government is not flying surveillance drones over Chicago ahead of this weekend’s NATO summit. 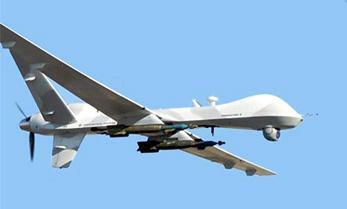 The FAA has not authorized any unmanned drones to fly over Chicago for the NATO summit, said agency spokeswoman Laura J. Brown. A Department of Homeland Security official said the aircraft shown in the video is not one of theirs. Chicago Police also don’t have any record of people calling in claiming to have seen unmanned surveillance aircraft. That stands in stark contrast to an incident in April, when Chicagoans flooded local media with alarmed phone calls as special operations forces in helicopters conducting a training mission over the city. An Air Force official called the video an obvious hoax, explaining that no unmanned drones are cleared to fly over a U.S. city or population center. Furthermore, the aircraft in the video moves across the screen faster than a real Predator can fly. The aircraft also appears to be carrying two Hellfire missiles, “And I can 100% assure you that there will NEVER be a time anywhere in the near future where anyone will be flying ARMED RPAs [drones]over our country, the official said. So there you have it. The government said it did not happen, so it obviously did not happen. It is clear from the title that the only people who could believe this hoax are stoners from the 60’s and the seriously “disturbed.” Tyranny is averted once again! Funny because after doing a tour in Afganistan seening drones everyday are common. An literally 5 mins ago a INFACT UNMANNED DRONE FLEW OVER NAVY PIER. Maybe my eyes are going.bad. but its memorial weekend an I know Im not losing it. – AN NO alchole was assumed…. Mp’s lead the way hooah. I saw them. This article is a cover up. I’ve lived in the city for years and I can confirm that this isn’t a hoax.